Male athlete fighter in boxer gloves. Young handsome boxer having workout at gym, dark background. Systematic training lead to big achievements. Handsome fighter in red gloves is boxing. 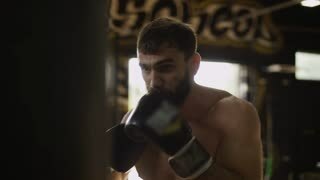 Young confident boxer practicing a kicks on black background, slow motion. Persistence and efforts lead to championship. Young handsome sportsman in gloves is boxing. 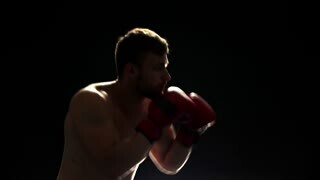 Young muscular fighter training on black background, slow motion. Young masculine caucasian male athlete. Athlete man exercising with dumbbells. Strong man having workout in gym. Get out of your comfort zone. Achieve your goal with systematic training.